Electronic Pill Dispenser - Each - SHIPS FREE! 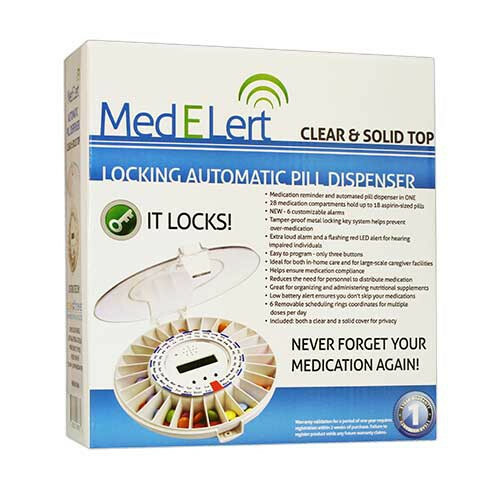 Med-E-Lert 28 Day Automatic Pill Dispenser is a locking pill dispenser that provides patient alerts when it is time to take medications. 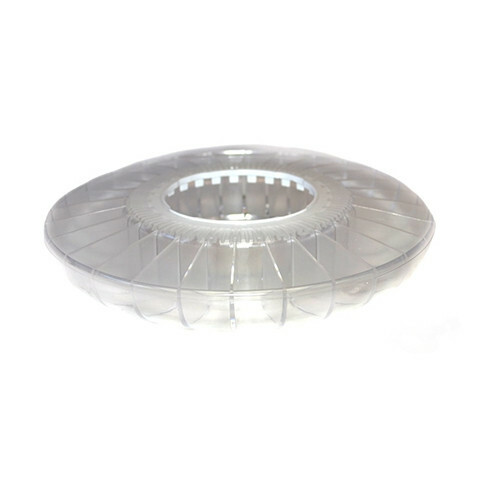 It is more than just a regular medication storage device. It offers a series of small compartments that may be periodically filled with pills and medications and then locked for automatic dispensing on a timed schedule. Constructed with a transparent lid, this electronic pill organizer allows the patient and caregiver to view upcoming dosages. In this manner, patients and caregivers can view upcoming medications and which administrations have already been completed. Caregiver can quickly monitor a patient's compliance and remind when ever necessary. Studies have shown that up to half of all patients fail to adhere to their scheduled medication requirements. Researchers estimate that more than $100 billion is wasted annually on avoidable hospitalizations due to missed medications and instances of overdose. There is a need for medication reminders and automatic dispensing devices that can notify patients when drug administrations are due. This specialized dispenser over a pill box can ensure the medications are taken at the proper time or that the patient isn't over medicated. 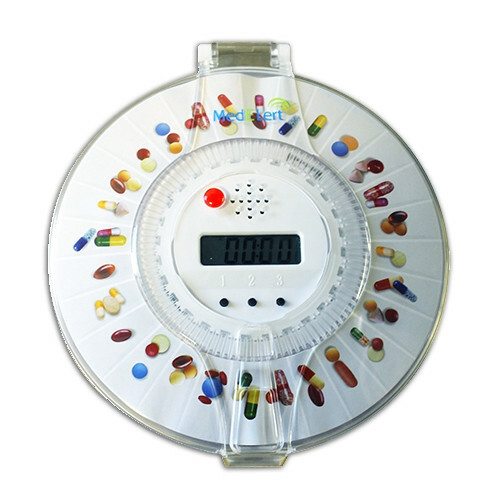 The Med-E-Lert pill dispenser is an advanced electronic pill organizer that locks medications from the patient until the correct time arrives for dosing. Improved adherence to medication dosages at the prescribed intervals can lead to improved patient health and reduced health care spending. 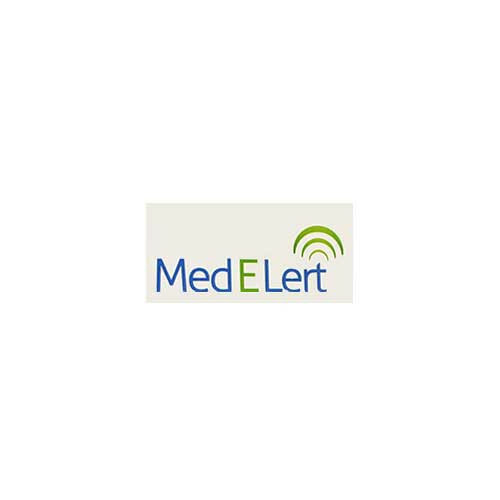 MedELert comes with programmable alerts to notify patients when a medication dosage is due. This compact medication management device uses small compartments in which pills are loaded and stored until it is time for dispensing. When the administration time arrives, the specified pill compartment for that time period is automatically unlocked. An audible alarm will sound to remind the patient that a medication is ready. The unlocked compartment is accessible to the patient for administration. This medication system allows individuals to self-monitor pill administration as well as it allows caregivers to track patient compliance. Caregivers may easily monitor medication schedule adherence by merely examining which unlocked compartments are empty. Unlocked compartments with a supply of pills indicate that the patient is behind in taking their prescriptions. Caregivers can then remind the patient of a missed pill administration. 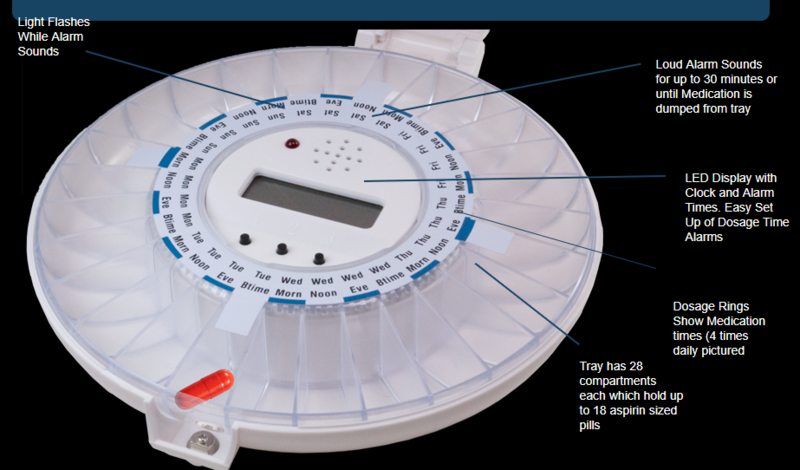 There are numerous differences between a pill organizer and an automatic pill dispenser. Organizers allow you to store pills in boxes marked for a certain time of the week and/or day. Many organizers have boxes for each day of the week and for AM and PM administration. Automatic dispensers also have numerous compartments that can be designated for each day of a four-week period, or for AM and PM for a two-week period, or for other combinations. Med-E-Lert comes with 28 compartments to offer many dosing combinations. 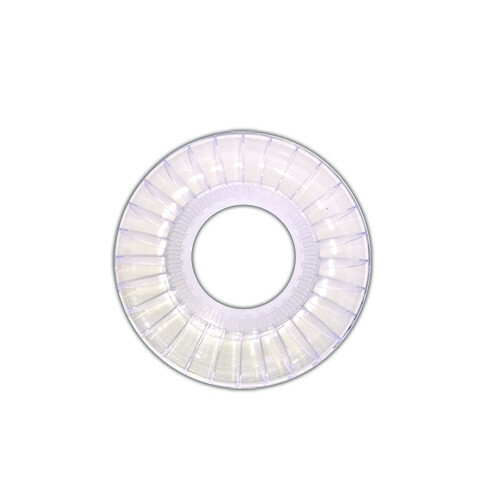 You may select from six different dispensing rings to insert into the tray to indicate the day of the week or the time of day for timed medications. This electronic pill box organizer is a medicine box that helps patients and caregivers prevent over- or under-dosing. Below is a list of the possible combinations that may be set for the Medelert. 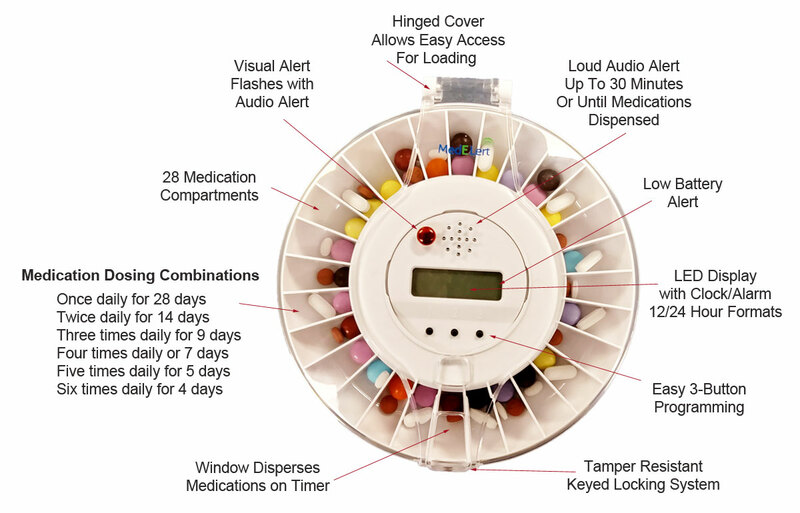 Automatic Pill Dispensers can be programmed to provide alerts to the patient or caregiver when it is time to administer another dose. Standard pill organizers have no such function. Instead, they are all memory based, requiring the patients and caregivers to remember on their own when it is time to medicate. In our busy world, it is easy to miss medication schedules due to distractions and other things that can interrupt a regular schedule. Audible and visual alerts can help remind you of when a pill administration is due. Often patients can forget when they have taken their medication and can take their meds numerous times within the same period of time. So when their prescription calls for a single doze during a specified time, the patient may be taking several dozes and in effect over-dosing. 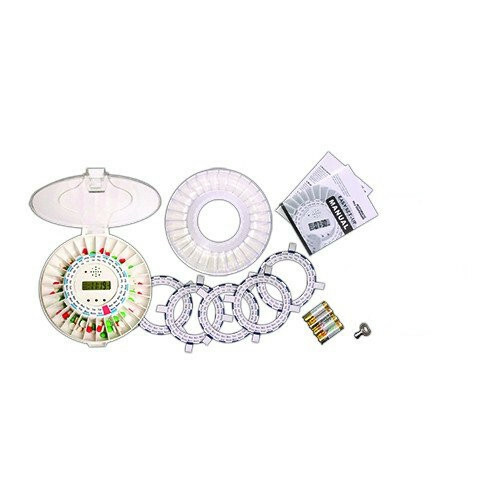 The Med-E-Lert system comes with a locking system that releases medications on a timed-schedule. Once locked, the medications are set on a timer for dispersal. Patients only gain access to the medication when it is time, protecting them from accidental overdoses. 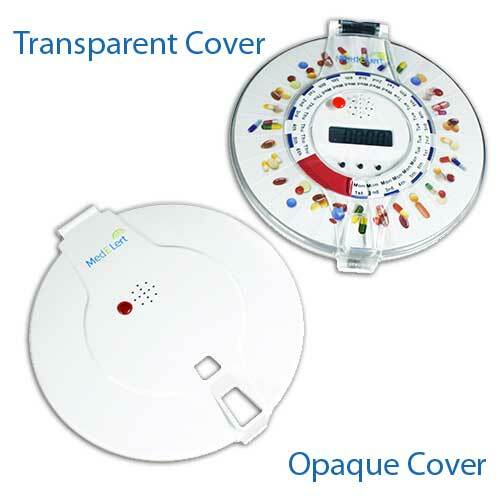 Med-E-Lert Pill Dispenser offers several advantages over the standard pill boxes or other types medication organizers. The MedELert is secured and tamper-proof, keeping medications away from the patient until scheduled. 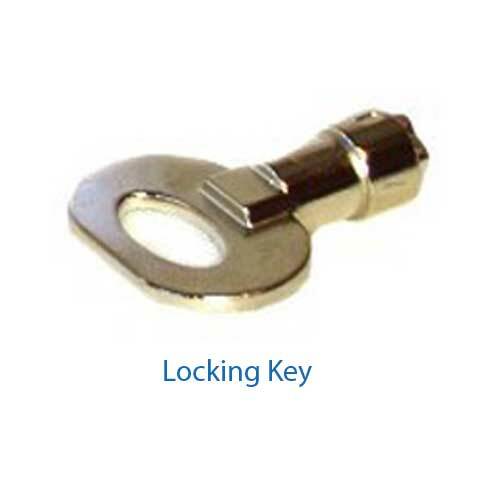 The locking system is activated by a metal key that can be secured in another location if a patient is predisposed to tampering with their medication schedule. This added security helps to avoid over-medication, protecting Alzheimer’s and Parkinson’s patients. This automatic tablet dispenser features 6 customizable alarms that include three different alarm tones. A blinking light also alerts patients when medications should be taken. These alarms and alerts do not turn off until the timed pill dispenser is tilted on its side to dispense the medication. 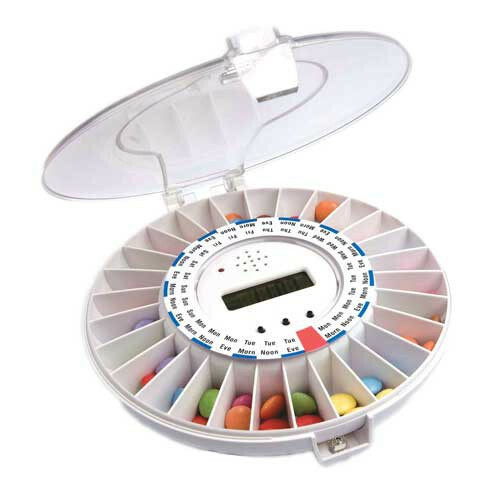 Vitality Medical carries numerous brands of pill organizers and Pill Reminders, including the Weekly Medication Planner Pill Holder, the Carex Medication Station and the One-Day-At-A-Time Organizer. Cutler, D. M., & Everett, W. (2010). Thinking outside the pillbox—medication adherence as a priority for health care reform. New England Journal of Medicine, 362(17), 1553-1555. Hayes, T. L., Larimer, N., Adami, A., & Kaye, J. A. (2009). Medication adherence in healthy elders: small cognitive changes make a big difference. Journal of aging and health, 21(4), 567-580. MacLaughlin, E. J., Raehl, C. L., Treadway, A. K., Sterling, T. L., Zoller, D. P., & Bond, C. A. (2005). Assessing medication adherence in the elderly. Drugs & aging, 22(3), 231-255. Zeller, A., Schroeder, K., & Peters, T. J. (2007). Electronic pillboxes (MEMS) to assess the relationship between medication adherence and blood pressure control in primary care. 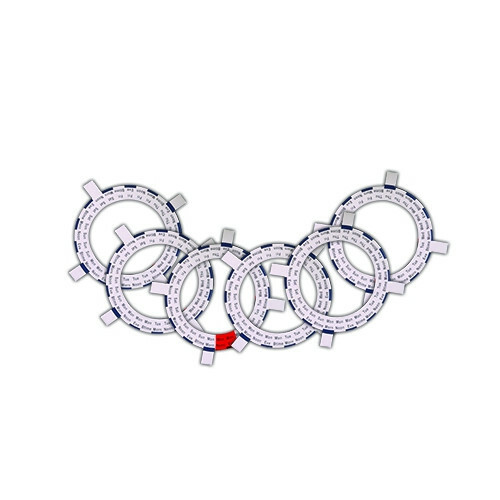 Scandinavian journal of primary health care, 25(4), 202-207. 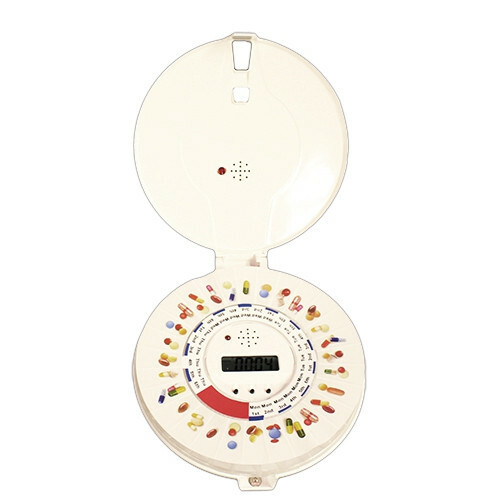 Product Instructions contains instructions to operate this pill organizer and reminder. Product Manual offers detailed instructions for proper product use and patient protection. Cover Exchange Procedure provides a step-by-step outline with images of replacing the cover on the Med-E-Lert. This is, without a doubt, the best system for elderly people who wish to retain control of the taking of their own medicine who also have memory issues. My 93-year-old mother used to take her pills from a pill tray. Every time I came to visit her I'd check her pill trays (she had four; each one was a week's worth) to verify that she was taking her meds properly. I noticed that half the time she didn't. When I'd ask her why she didn't take her pills on any particular day, she couldn't remember. Since I started her on using this dispenser two months ago, she's only missed ONE night time of taking them. Even SHE has told me "this is a God-send!" And believe me, coming from her that is very high praise! My only regret now is that I didn't buy this YEARS ago! The amount of stress and worry this device has taken off my shoulders is immeasurable!! Great idea so far! My mom is in the mild to moderate stage of dementia and it seemed she was constantly "playing" with her medications, which mixed up the doses. Every morning for 2 weeks, we had the exact same conversation on my way to work, which was me telling her to leave the pills alone! She still argues with me that she did not take a double dose of her night meds, that the nurse mixed them up, but he only left 4 nights in her old box, and a day later there was only 1 left.... This locking box keeps her hands out of them!! Its been less than 2 weeks, but there hasn't been any issues of missed or over dosed meds....a huge relief for me. Very pleased with this product, Life Saving for someone that can't remember to take their meds, or for those who take Meds when the shouldn't and OD on their meds. My mother is starting with Dementia it took about a week for me to convince her that she can't open it that it is Timed to unlock and dispense her meds but know she is getting the drift of it. Has been so helpful and she still feels in "control" of taking her meds. Highly suggest this locked timed Med dispenser, for anyone have a problem taking and remembering their Meds.